June 21st arguably marks the start of best season: summer! I say arguably because some fortunate ones, like folks in Los Angeles, experience summer weather all year long so they really can’t tell the difference. What’s best about summer? Beaches of course. Unless you’re a student, in which case your answer is: vacation! These go hand in hand. Beaches make the best relaxation spot to get your tan on. And while you’re shopping for summer outfits, you might want to flash some beachy accessories from Bel Air Jewelry. This Multicolored Cabochon Sapphires and Diamond Dolphin Bracelet is a great piece to kick off summer solstice. The beautiful creatures made of round-cut diamonds look like they’re playfully passing beach balls made of red and blue cabochon sapphires. What exactly is cabochon? It refers to the way the stone is cut and smoothed to showcase the vibrant colors and sapphires are known for having a variety of hues to appeal to any collector. You’ll definitely be the center of attention by pairing an already luxurious fashion statement with beloved dolphin earrings balancing on matching cabochon sapphires. Sapphires of blue and red look best alongside pave diamonds to resemble the patriotic American flag. Attending a big event for July 4th? You’ll look more eye-catching than a fireworks show with a pair of Pave Diamonds and Multicolor Cabochon Sapphire Dolphin Earrings. Dolphins are stupendous, but if you want to search the sea a little deeper for trend-setting fashion, wear these rare Golden South Sea Pearl Earrings with 18k gold. Summertime calls for a new dress code: light, bright, and out of sight. Look your best with unique golden pearls found no where else. 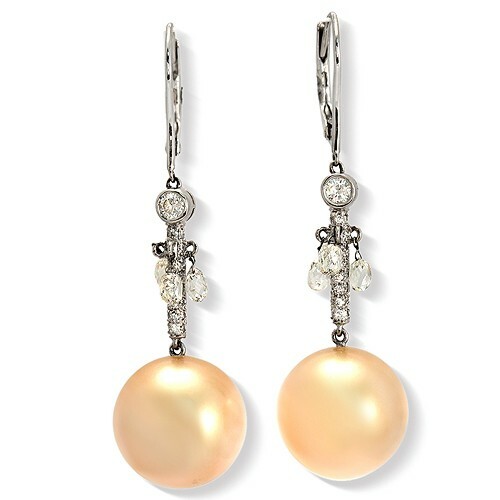 These earrings with surely sparkle like white crests on the California coast. If you’re visiting the Golden State for the summer, be sure to visit us for a golden upgrade to your jewelry collection. Bel Air Jewelry celebrates 27 years (that’s 27 summers) in Los Angeles, offering celebrities, fashion aficionados, and classy customers the best high-end fashion statements for every season. Come see why our collections are as popular as California beaches. Many recognize emerald as the birthstone of May, but what you may not know is that emerald also holds the special title of Pantone’s Color of 2013. If you’ve never heard of Pantone, it is a leader in fashion known for its association of hues and knowledge the color wheel in general. Annually Pantone selects a color that represents the year and everyone from the fashion industry to Hollywood incorporates it in their style for the next 4 seasons. Stick around and we’ll have all the coverage you need, especially when it comes to emeralds, at the one and only Los Angeles jewelry expert headquarters, Bel Air Jewelry. 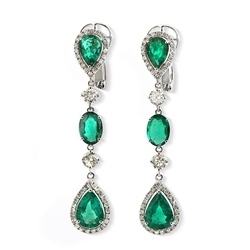 We ring in the new year with a shower of confetti, but what if every year began with a shower of emeralds? While we can still dream, the closest to making that a reality in 2013 comes in the form of rain droplet-shaped emeralds in this stunning pair of Emerald and Diamond Dangle Earrings with 18K White Gold. This delicate pattern of diamonds, white gold, and emerald make up the holy trinity of high fashion: a perfect accessory for today. In the early summer, foliage becomes the greenest and the color truly pops out in parks and beaches around California. 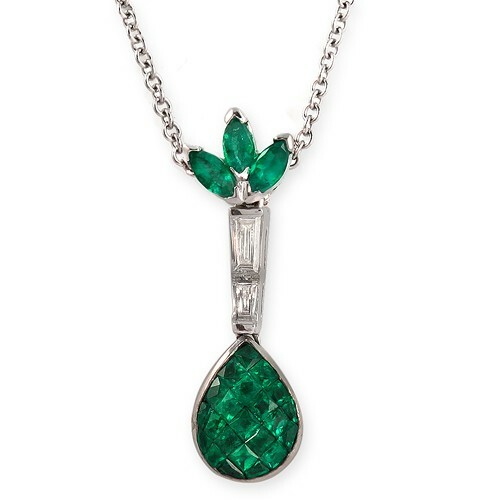 Like a a trio of earth-tone leaves growing from diamonds, this irresistible Marquise-cut Emerald Necklace in 18k White Gold sets the standard in fashion for 2013. And to tie it all together, the giant emerald raindrop is sure to catch anyone’s eye during all seasons. 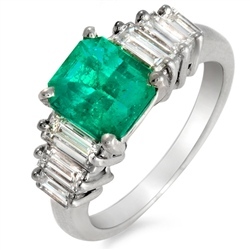 Ancient history tells us that believers donned emerald rings to keep from getting sick. Cleopatra worshiped emeralds not just for its mythology, but its pure beauty and powerful emotional ties to love and devotion. The same belief is held by today’s world leaders and celebrities who wear their best gemstones in public, like this rare Radiant-cut Colombian Emerald and Baguette Diamond Platinum Ring. Colombia is the #1 source of the world’s most precious emeralds dating back 4000 years before 2013, the year this gemstone would be the highest acclaimed. Don’t let 2013 fade away . Celebrate your milestones this year by contacting Bel Air Jewelry. Let them help you find the single best emerald in all of Los Angeles.